In a study by Albersten, a significant survival advantage for surgery over surveillance was noted in treating poorly differentiated disease (Gleason score 8-10).13 Moreover, a watchful waiting strategy is not free of complications. 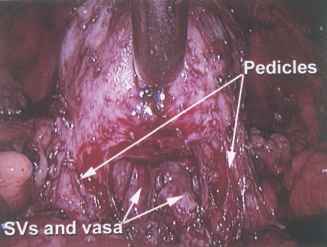 Local progression from prostate cancer can result in ureteral obstruction or bladder outlet obstruction. In a review by Aus and associates, 17% of patients who were managed expectantly underwent procedures to relieve upper tract obstruction and 41 had at least one channel transurethral resection of the prostate (TURP).12 Metastatic prostate cancer can cause severe bone pain, pathologic fracture, spinal cord compression and death. Presently, the Scandinavian Prostate Cancer Group and the US Prostate Cancer Intervention Versus Observation Trial (PIVOT) are two large prospective randomized controlled studies comparing radical prostatectomy and watchful waiting as treatment modalities for localized prostate cancer.14 Until the results of these studies are available, prostate cancer remains the second leading cause of cancer death in men with a 50% suggested death rate in men who are diagnosed with a moderately well-differentiated disease and a life expectancy of 15 years or more.15 We believe that younger males would be best served by surgery, since they are at risk of their disease for many years. Watchful waiting should only be reserved for older patients with low Gleason scores.